After withstanding Bramley pressure in the first ten minutes, ‘Ensians eventually settled down and enjoyed a territorial advantage in the first half to take a 7 – 0 lead at the break. After an early response from the visitors in the second half to level the scores with a converted try, the hosts never really clicked into gear allowing the visitors to run in two more converted tries to one from the home side to give them a victory. It was the visitors who applied the early pressure, camping in the home 22 and attacking the line for ten minutes with both forwards and backs linking well to bring out the best in the home defence. The pressure was relieved with a long touch kick from full back Kristian Keinhorst to set up a lineout in midfield. From here, the hosts used ball from the lineout through flanker Ali Campbell to mount some threatening attacks through centres Dom Oddy and Luke Cowdell. Several promising moves came unstuck through solid Bramley defence and indifferent handling. No. 8 Lee O’Donnell put in some forceful drives and props Tom Twist and Ross Nichols were on hand to maintain the momentum. The scrums were fairly even, but home ball was often untidy and ‘Ensians struggled to get the ball away smartly with stand-in scrum half Will Foster having a difficult time. For their part Bramley enjoyed plenty of clean possession and their backs handled and backed up well with speed and determination to keep the home defence busy. Play was fairly even with both sides attempting to run the ball, but the ‘Ensians pack put in some good drives to take play up to the visitors’ line through locks Toby Barltrop, Ben Smith and flanker Ollie Cooper. After a few close calls, Foster popped the ball up to prop Ross Nichols who barged his way over half way out with Keinhorst adding the conversion to give the hosts a 7 – 0 lead as half time approached. In the second half props Greg Jones and Josh Dyson came on and added a bit of extra stability to the scrums, but ‘Ensians passing was laboured and the backs made little headway against a well- organised defence. Bramley gained good field position through a penalty and some good drives from their pack set up play near the home line. Quickly re-cycled ball and slick passing produced a gap which they happily took advantage of to score near the posts. The conversion levelled the score at 7 all on 46 minutes. Now with their tails up, Bramley used good interplay between forwards and backs to camp in the home 22. A driving maul by the visitors tied in the home defence and the Bramley scrum half scampered round to go in unopposed for a converted try to give them the lead at 14 – 7 on 56 minutes. ‘Ensians came back strongly and at last managed to get the back line moving at pace. Centre Cowdell drew his man and put winger Declan Jackson away to dive over in the corner. The conversion failed leaving the visitors with a slender 14 – 12 lead on 64 minutes. Sensing they were now in with a chance of snatching the lead back, the hosts tried hard to move the ball wide, but too often speed off the line in defence by the visitors and careless handling meant promising moves broke down. Jackson was again given a chance down the wing, using his pace to round defenders and dive over in the corner, only to see play called back for a foot in touch. Both sides continued to mount attacks, but safe hands and good offloading gave the visitors the edge as they continued to pose threats. In what appeared to be a fairly innocuous move up the right, the visitors spread the ball wide with the hesitant home defence caught flat-footed as the Bramley winger outpaced the cover to score wide out. A good conversion stretched their lead to 21 – 12 on 76 minutes. In the last few minutes, the hosts tried hard to get moves going, but the visitors continued to mount their solid defence to come out on top. ‘Ensians have players missing, but even so this was game they could have won, but they were unable to up the tempo and run the heavier Bramley forwards around and thus provide a platform and opportunities for their own speedy backs. To be fair to the visitors they handled, offloaded and defended well throughout to come out as deserving winners on the day. After a very poor match report the week before nearly caused a riot (by newly sacked chairman Steve Robinson), ghost writer & award winning author Pete Tempest was brought back to restore some calm & pride to the proceedings. Modernians 3rds are a conveyer belt of leeds uni students who, if likened to cars would be Ferraris & Mini Coopers running on 80 minutes of fuel, while the combined team of Ensians & Viscounts were more like old ford Transit vans, some running on half tanks or less, with a couple of Mini Coopers & Ferraris in the mix. This was a Viscounts fixture & the teams had combined as both are struggling at the moment for players. 4. finally, make your tackles !. The ref for the day was a young lady who did an excellent job in the testosterone filled arena that is rugby. To show that chivalry is not dead, one player trumped while she checked his boots (the strain of lifting his leg ?) & another exclaimed it was butts not boots she was looking at! The game started with Otley keeping the ball tight & driving forward, until Matty Tenniswood at standoff decided to chip over the Mods defence, only for the Mods red arrows set off up the field & score. From the kick off, Mods set up the ball & set off up the field again. With the tackling looking more like five year olds playing patter cake, patter cake baker man in the play ground, Mods scored again on 10 minutes to make it 10 – 0. With Matty T putting a good kick off on to the ten metre line, Otley took the ball & drove on & when the ball was spun out, Sean Leddy made a good break, but dropped the ball. From the scrum, Mods tried to run it out of their own half, but Sean made amends by intercepting & putting it down between the sticks for Matty to convert & make it 10 -7. As fatigue set in, penalties were conceded & Mods turned them into tries, running them from everywhere on the field to make it 29 – 7. 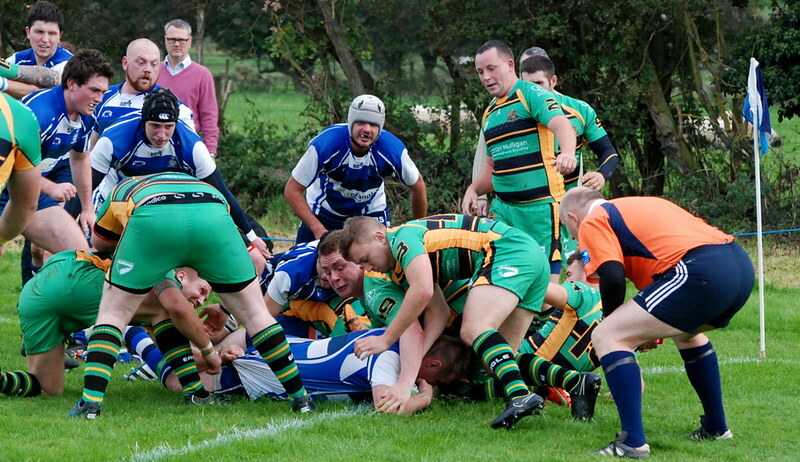 When Otley tried to move the ball, it was dropped & Mods picked it up & scored on half time to make it 36 – 7. At half time there were some stern words about the tackling (or lack of it) & the game plan which was don’t kick the ball to them and keep it tight. There is a old saying about a game of two halves & this was one of those. Mods kicked off & Otley secured the ball, young Alex Burnet at scrum half used his forwards with Wheely, Paddy, Ben Jones & Bonner making hard yards. In support was Scottish international tiddly winks champion & journeyman Jock, with Jimmy & Jamie Chapel making holes for Thailand bound lady boy lover - Ben Tetley to score. Matty converted to make it 36 – 14 on 43 minutes. From the restart, Best Kebabs pin up model for September, Big Eddy, caught the ball, set off in first gear, changed into 2nd & wrote a couple of Ferraris off. Mick Wilson did the same, with Jamie Chapel, ben Jones, Wheely bin & paddy making good drives. Matty T made a good break & passed to pint sized power house winger Tyson who scored between the posts to make it 36 – 21. Mods again kicked off to pin up boy Big Eddy, who again ploughed into a couple of Mini Coopers, denting their wings. Alex Burnet was pushing his troops on, with paddy, Mick Wilson, Wheely & Jimmy making good drives. The backs were now gaining in confidence with Connor Paley moving into the centres with Sean Leddy. After a good ball from Matty, Connor turned & twisted his way over the line & with conversion it was 36 – 28. Now looking like a different team, Otley took the game to Mods & when Mods were caught offside , Matty kicked them down into their 22. From the line out Jamie Chapel leaped like a salmon in the line out to secure good ball (like Steve Wade but more athletic). Alex spun the ball out for Matty, Connor & Sean to cause all sorts of problems for the Mods defence. Paddy, Ben Jones & Bonner drove on, then Big Eddy took the ball at pace [ faster than walking ] which took four Mods out before Alex spun the ball out & Tyson ran in another try to make it 36 – 35. With 22 minutes left everything was to play for. Unfortunately just when it looked like a win was on the cards, three things happened. First Mods went uncontested which took Otley’s old Transit vans out of the game. Second, Mods changed a couple of Mini Coopers for Ferraris in there pack, while Otley only had another old Transit van on the side lines. Third, Matty Tenniswood broke the cardinal rule & kicked the ball to the opposition, the Mods red arrows set off up the pitch to score to make it 41 – 35. Otley came back but after a turn over, the red arrows set off to score again to make it 48 – 35. Otley should of scored on the last play of the game, but were denied by some wandering Mods hands when the ball was set, & they managed to clear their lines. This was a good game, where the Mods full back was outstanding & ours was erm… standing, which showed if you get your game plan right & play to your strengths then anything is possible (as long as you tackle).